A cannabis user has unveiled plans to open an centre to help test drugs which have been brought by the public. Steve Melhuish, from a group called Faces, has so far raised £20,000 through crowd-funding and his project has won support from the police. Mr Melhuish said: "This will be a safe place to come and to show it can be consumed properly." But critics say the founder had no medical or academic standing to tell young people the facts about drug use. Faces do not condone drugs use and will not allow it on the site, Mr Mulhuish said. They have no yet leased the building. National Drug Prevention Alliance member, David Raynes said: "The fact that he is a cannabis user himself and admits it himself - he's not a good role model for teenagers. "Teenagers need straight advice. The problem with this centre is that he is going to allow people to bring cannabis they've brought off the streets to that place." Although there are no plans to allow cannabis use, he believes Mr Melhuish was in "grave danger of breaching the law" by allowing drugs on site. An on-site cafe will fund running costs for the centre which aims to teach the dangers of continual drug use and help young people who are referred via the police, council and local schools. Drugs can also be tested on site for contaminants like Spice, a powerful synthetic drug. Mr Melhuish also aims to help children avoid getting involved with drugs gangs. A spokesman for Avon and Somerset Police said: "Neighbourhood Sergeant Lee Kerslake and his team are aware of Mr Melhuish's plans to create a project to help young people understand the devastating consequences of drug crime. 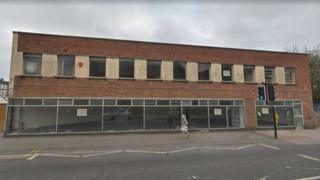 A planning application is being submitted to North Somerset Council this week and a building on Station Road is already being leased to the Faces group.